The following links may help with some general questions that you may have. Click below to visit these suggested sites. Click here to review ratings for a charity before donating. We are currently welcoming new customers in 2019 for the 2018 tax season. We are equipped to file income taxes in all states. If this is your first time having your individual tax return completed by us, please download and complete our tax organizer. You can either call us to set up an appointment to bring in your organizer and tax documents or you can drop off or mail the completed organizer along with your tax documents. Be sure to carefully complete the contact information on Personal and Dependent Information Page . We look forward to seeing our clients again in 2019 for the 2018 tax season. If you would like to complete a tax organizer, simply contact us and we will send you a link on our secure web server for you to use to download your personal tax organizer. This document will include your information from the previous year, which will help you in organizing this year's income tax documents. The best way to request an email link is via email so that we may be able to be sure we have your current email address. If you do not use email, please contact us and we can mail you your organizer. When you are ready, you can either call us to set up an appointment to bring in your organizer and tax documents or you can drop off or mail the completed organizer along with your tax documents. Be sure to carefully update the contact information on the first page. 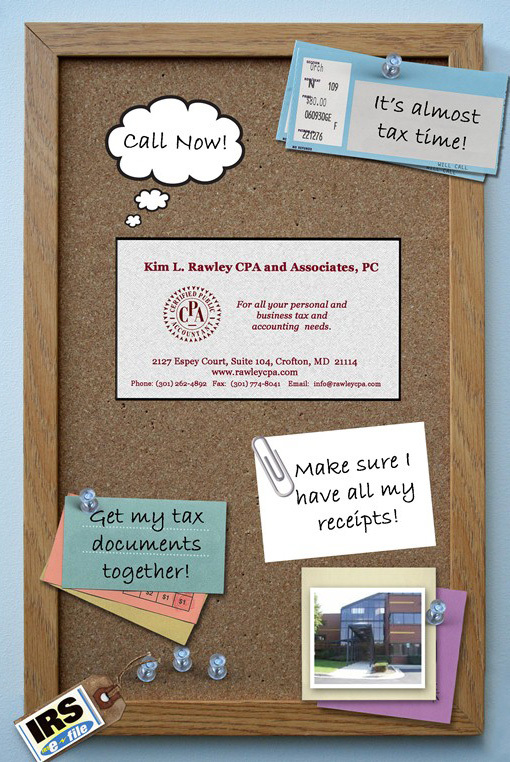 We look forward to seeing all our clients next year for the 2019 tax season. Meanwhile, if there is anything that we can do, please do not hesitate to let us know. To access forms most commonly needed by our clients, click below.